Sheikh Abdullah bin Bayyah is an instructor at King Abdulaziz University in Jeddah. He was the deputy head of the Union of Muslim Scholars. Before this, he served as a judge at the High Court of the Islamic Republic of Mauritania and was the Head of Shariah Affairs at its Ministry of Justice. He currently serves as the president of the Forum for Promoting Peace in Muslim Societies. 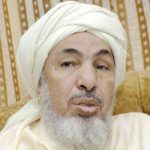 In his fatwa, Sheikh Abdullah bin Bayyah states that UNHCR would be considered the agent of the individual owing zakat, and that there is no problem so long as the principal believes that the agent will deliver the zakat to deserving recipients.